Over 50% of Americans don’t have enough money to invest in stocks; a scary statistic for a country that claims to be the only superpower left in the world. It makes one wonder at what cost are we maintaining this superpower status when from an economic perspective we appear closer to a third world nation. Americans appear to be living hand to mouth making it harder and harder for the average to focus on his or her financial security. One in seven Americans still depends on food stamps despite this so-called economic recovery. Having money tucked away for a rainy day is one of the keys to financial health but trying to save is a struggle, as the biggest money challenge for Americans is sticking to a budget. Additionally, Americans tend to spend money on things they don’t really need at all. Point and case; Americans spend $1200 or more a year on coffee. Would it not make sense to invest this money in the markets as opposed to tossing it at a cup coffee? According to GOBankingRates over 62% of Americans don’t even have $1000 in savings, yet the average American can spend $1200 on a coffee a year. Cut the coffee out and at least increase the amount of money you have in your savings; seems simple but yet these simple measures elude most Americans. The best option as we stated earlier would be to invest this money in the market. One could take on more risk as this money was wasted money, to begin with. Now imagine if the average Joe put similar measures in place, like not buying junk on impulse or delaying the purchase of that new car, or cutting back on cable TV, etc. All these measures would increase the amount of money you could allocate towards your 401K or IRA plan. 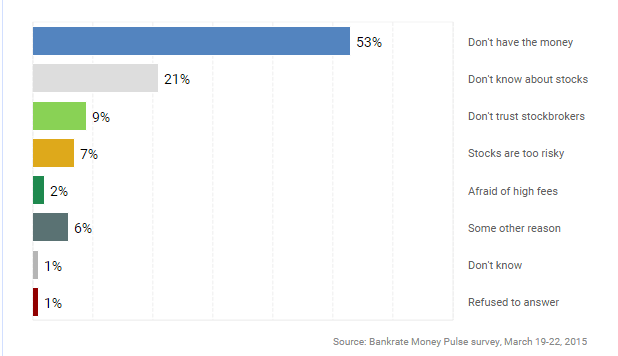 The chart below from Banktrate.com illustrates that a total of 74% of individuals either don’t’ have enough money to invest in the stock market, or they don’t know anything about stocks. We already demonstrated how a lot of individuals claim not to have enough money but yet find a way to purchase stuff they don’t need, like an overpriced cup of coffee. Understanding the markets is a lot less complex than it’s made out to be; there are numerous resources out there and with a little hard work the average Joe can go from knowing nothing to knowing more than most experts on Wall Street. Random tests have already shown the monkeys with darts fare better than most of these experts would. Americans are still spending money on things they don’t need, and they are still suspicious of the markets. Which means from a mass psychology angle this market will continue to trend upwards. If one looks at the sentiment data, one can see that for months on end the combined percentage of individuals in the bearish and neutral camp has consistently come in at over 60%. This tells us that this market is still one of the most hated bull markets in history. 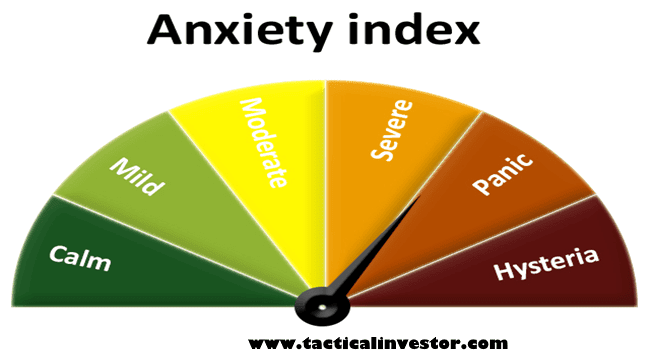 Our custom “Anxiety Index” has consistently oscillated for months on end in the extreme zones which range from severe to Hysteria, as illustrated by the image below. This index gives us a peek into the mass mindset; it allows us to see whether the crowd is anxious or calm when it comes to investing in the markets. 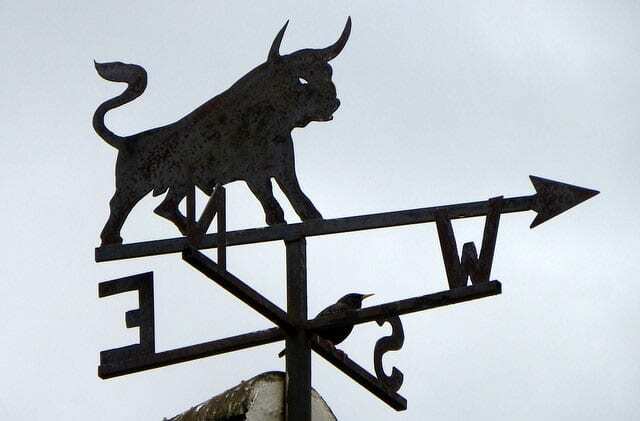 The readings for the past few months consistently indicate that the crowd is apprehensive and as expected the bull has continued to trend higher, destroying a large swath of bears that dared to think otherwise. Until the masses embrace this market, it is destined to trend higher; no bull market has ever ended when the crowd is apprehensive. History indicates that bull markets usually end on a note of Euphoria.